The survey aimed to explore what 3D data people were aware of, how to access it and what they re-used it for. The outcome of the is intended to help the ADS better disseminate 3D data on the website. In the long term the inclusion of an easily accessible method to view the 3D data may lead to more traffic for the ADS archive while increasing the viewership, use and re-use of various projects. The questionnaire was published on the ADS Sound Bytes blog, Twitter and Facebook to gain visibility to ADS users. Some participants received the questionnaire via email. Before looking at the survey results it is important to view how the ADS portrays such data within their search functions currently. As the ADS accepts 3D data in their archive, depositors who have used 3D technologies to digitize and record specific data are able to publish their work with the other data they have collected for their research. As there are thousands of archives found within the ADS, there is a “KEYWORD” search bar to help navigate and find specific projects relating to the keyword. There are also various filters regarding different pieces of interest such as looking up “WHAT” the user is interested in whether it is an event, evidence, object and so on. Users are also able to toggle “WHEN”, “WHERE”, and the “RESOURCE” to continue narrowing down their navigation (Figure 1). 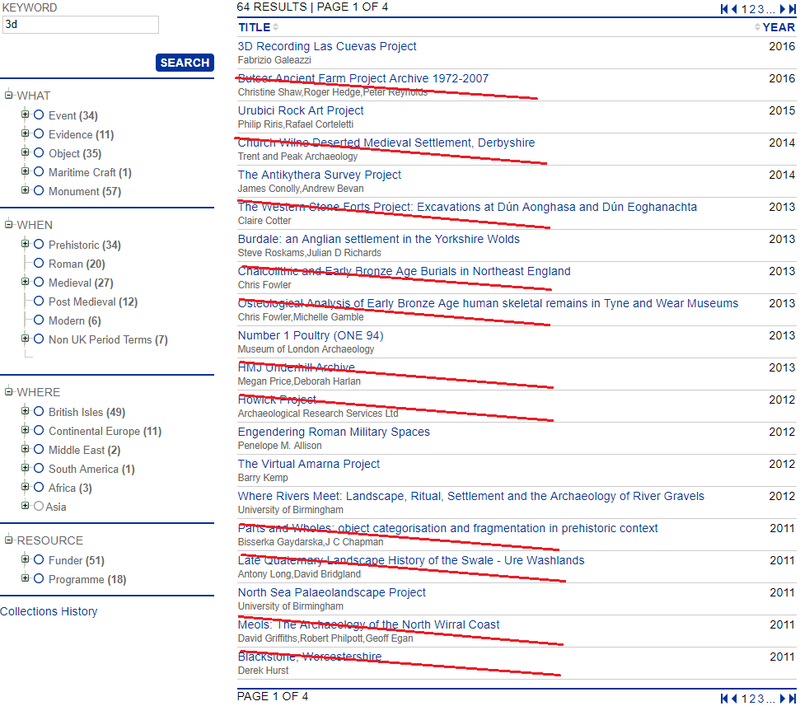 These filters grant users the ability to find all the archived projects relating to their research interest. However, the results of these filters are entirely reliant on the metadata provided by the depositor to the ADS at the time of deposit. While selectively searching for 3D data may not be overly common in archaeological research, there are instances where some users only want to search for data that is 3D. Utilizing the keyword search bar to navigate for finding 3D data is, however, not the best method to find such data. After searching ‘3D’ there were 64 results from the query. On the first page the 20 results appearing appeared to have potential to contain 3D data due to being the newest archives as the query searched from newest to oldest. Only 6 of the archives contained actual 3D data (Figure 2). This is because the search facility searches on what teh depositor wrote in their archive description and provided in there collection metadata. Therefore if they referenced 3D at all, it will return a positive result. This arises a question of what would be the easiest and most accurate method to search for this form of data. The ability to query for ‘intrusive’ and ‘non intrusive’ events under the “WHAT” filter provides accurate archives relating to this search. Therefore, would it not be more beneficial to incorporate a ‘3D’ tag under the “WHAT” category? However these tags are taken from the national cultural heritage thesauri created by Historic England, Historic Environment Scotland and the Royal Commission on Ancient and Historical Monuments Wales which do not contain an appropriate term. The questions found within the survey regarded the overall interest and re-use of archaeological 3D data. With fourteen participants, twelve responded they have previously interacted, created and/or managed 3D data. 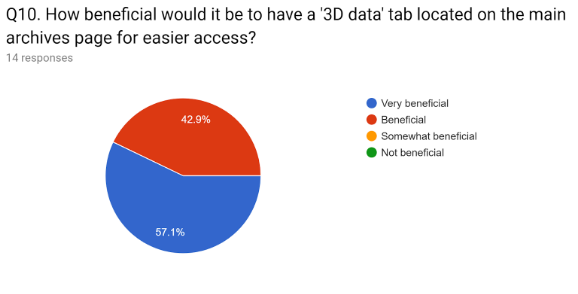 There were two participants who were unaware of several factors of 3D data provided by the ADS as they responded ‘no’ to several answers especially about creating or managing this form of data. An important factor when using an online 3D viewer is the navigation. The 3DHOP viewer provides icons with informational text showing when the mouse hovers over the icon. This provides an insight to the users as they do not have to guess the functionality of what these icons provide to the viewer. One question asked the participants who had used the 3DHOP viewer about the level of difficulty when using the viewer. Three of the six participants responded that the viewer was ‘extremely easy’ to use while the other three responded ‘very easy’ to use. One of the more well known, public 3D viewers is found on the website Sketchfab where users can upload any type of 3D model for other users to see and potentially download if the creator enables the option. As it is a well-known viewer, it can become a standard for some users regarding the functionality and navigation especially by providing a help icon to inform users how to use the viewer. 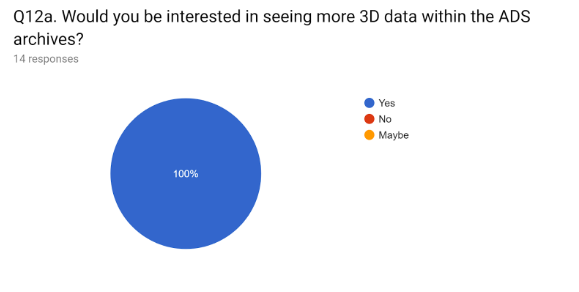 The following question asked the participants about their opinion of the 3DHOP viewer in comparison to other 3D viewers found across the internet. One participant answered it was ‘excellent’, four answered that it is a ‘very good’ viewer while the other three responded that it was ‘good’ which are positive reviews by these participants who interact with 3D data. A key factor for this questionnaire was to gauge the overall interest in the accessibility of 3D data in the ADS archives. To find out how 3D data should be prioritized and discover if having a way to search through 3D data would be beneficial or even wanted by users. This was addressed in one of the final questions of the survey which asked participants their opinion of how beneficial it would be to include a 3D data filter on the main page of the ADS archives. Eight of the fourteen participants answered it would be ‘very beneficial’ with the other six responding that it would be ‘beneficial’ (Figure 3). Overall, all fourteen respondents indicated a general interest in 3D data found in the ADS archives (Figure 4). Figure 3. Question 10 from the questionnaire for incorporating a 3D data tab. Figure 4. Question 12 from the questionnaire for additional 3D data in the ADS. As all fourteen participants responded of wanting to see more 3D data within the ADS archives, it would be beneficial to include a method to easily access the data whether it be from an additional tag on the sidebar to query out 3D data. This next and final part in the series will look into the outcomes of the research from both this and the previous post with suggestions for improvement and future work: Final Thoughts and Recommendations.